Which FishDuck.com “Opponent Spoof” Pictures do you Like BEST? Boy we have had some fun on this site over the years, and I kind of forgot until I recently had time to go through a bunch of prior articles for some new sections of the site I’m working on. I found four of my all-time favorite “Opponent Spoof” pictures and wanted to share them here. My purpose is twofold: 1) to see if you all think they are a good as I do; and 2) to see if you agree which one is best (note: these are out of thousands of candidates). I really thought that No. 1 and No. 2 were equal, as they both cracked me up upon reading, but I give the slight edge to Kim Hastings‘s picture and caption because he was the first to create such humor with a picture, and especially the caption. He really inspired and taught the rest of us writers and editors the value of a caption, and how it can be more fun than the body of the article. No surprise here, as Kim is a professional writer who gave articles every week for four years as a volunteer. We have other very talented writers such as devoted Duck fan and CPA Mike Merrell, who has been working with a Hollywood screenwriter adapting his first novel into a screenplay. He took Kim’s concept concerning the captions to another level with his entry. The setting is early 2015, just after the terrorist attack in Nice, France, and the citizens of the United States were expressing our solidarity with our long-term ally and friend. College football teams across the U.S. were expressing their thoughts of support for the French people as well. 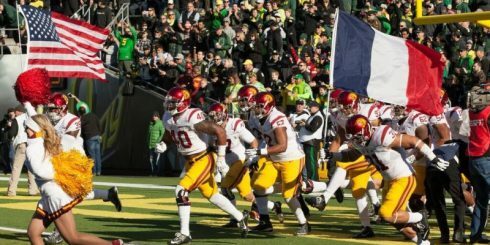 When USC came to town, folks took notice of the Trojans pre-game action (see below). It was a thoughtful gesture, but carrying the French flag into battle seldom works out well. Of course, this did not help the Trojans, as our beloved Ducks whomped USC. Quarterback Vernon Adams chewed up the vaulted Trojan defense, which was a joy to watch on that glorious fall day. I still giggle seeing this picture and everyone I’ve sent it to has howled in response. It is fun to mix a little history with humor to poke fun at those that regularly need a little comeuppance. With Mike, this was the beginning of some amazing articles at FishDuck.com. He had some other picture captions that were quite funny, but none rival this one. We go back to spoofing the Beavers for the next one … they are too easy a target to miss, and it never gets old shooting at them! 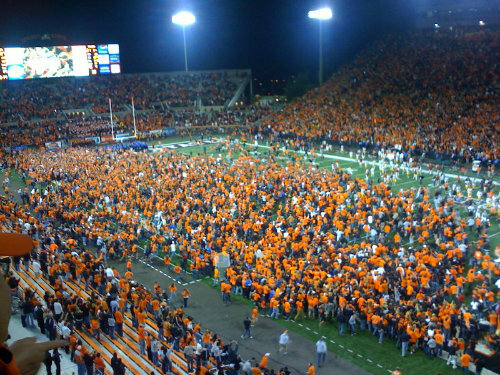 This next picture and caption by yours truly was taken at the Civil War game in Corvallis, with the winner going to the Rose Bowl. 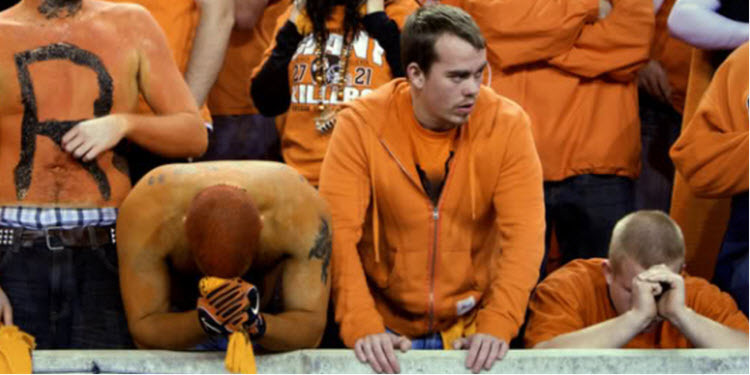 Oregon laid a 65 point egg on OSU in Reser Stadium. This was in an article recently, but I still snort in delight at what you see above. The photographer, Kevin Cline, saw the touchdown occurring by Jeremiah Johnson before halftime and got set up for the perfect picture once J.J. crossed the goal line. It is an ideal depiction of hopelessness and despair, and a fantastic shot to boot! Kevin has been a volunteer, like our writers and editors, and has given us so many superb pictures over the years. I never thought I would be so indebted to him for providing me some humor! 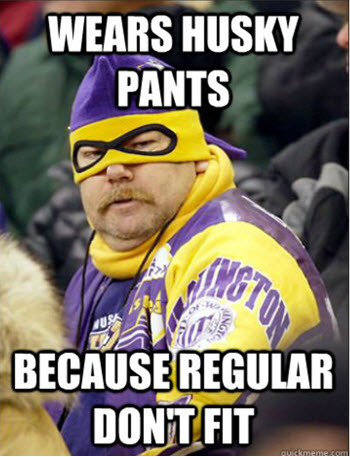 Finally, you shouldn’t kick a dog if he’s down … unless said dog is a Washington Husky fan. 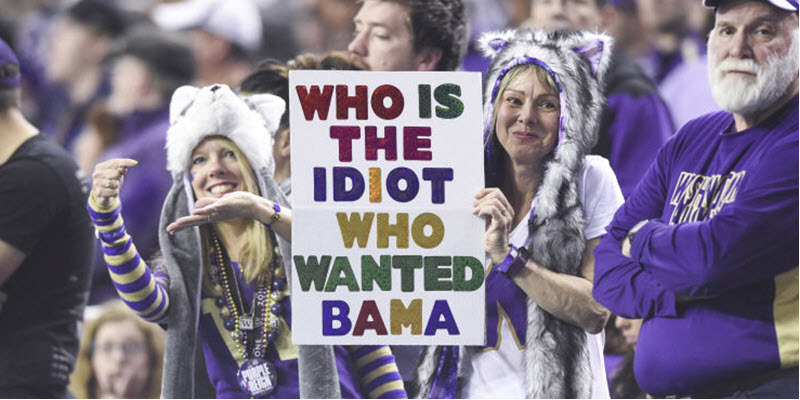 We know how things change over time, and return of the Huskies was inevitable, but boy did we enjoy the streak of Oregon victories over Washington–the Dirty Dozen to purple fans–and all the fun associated with it. The next picture (right) was in an article this season about the myths of Husky championships. Dog-piling the laughs seemed like the natural thing to do. Yes, this is sophomoric humor; but it is funny, and now we can reflect on that win streak in an “oh those were the days!” fashion, as all fans are wont to do. The Huskies were so desperate for relevancy, and yet their fans found themselves neutered that winless year after all the barking was done. So there we are! It is quite possible these won’t come off the same as they did inside their original articles, as the context is always crucial, but I thought we could attempt a little offseason fun. Which is your favorite? My friends, consider checking out the new book by Kim Hastings. It is inexpensive for Kindle readers and really wonderful. I encourage you to support a writer who has given hundreds of hours for the benefit of all of us Duck fans, loves his hot wife (he really out-kicked his coverage on that one), and hates the Huskies like all true Oregon fans. Check it out by clicking here.